Jojoba is the universal oil, the oil closest to the skins own natural sebum, which makes it good for all skin types. It promotes healthy skin by stabilising and maintaining the intercellular structure and assisting in moisture retention. It can be used for everything from Acne to Eczema and is a wonderful choice for baby massage as it is non-allergenic and odourless. It can be used as an oil cleanser to remove makeup and as a moisturiser for the face and body. Jojoba oil can also be used for massage as it has excellent slip and absorption. This is the only oil recommended for Eczema skin types by Damadi due to its low reaction rate and easy absorption by such sensitive skin. 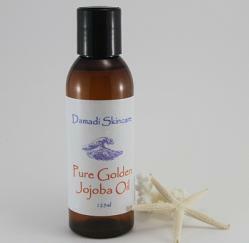 Best of all Damadi's Jojoba oil is grown in Australia. To remove make up simply dampen your skin with water and massage a little Jojoba Oil into it. Then gently wipe it off with cotton pads or a damp face washer. If you are wearing heavy makeup you might have to double cleanse. Jojoba will even remove water proof mascara, apply some Jojoba to cotton pads and sweep down the eyelashes to remove the mascara. Try not to get it into your eyes, it won’t hurt but it will make everything a little blurry for a while. As a body moisturiser, when you have stepped out of the shower and your skin is still damp, apply a 10 cent coin sized amount of Jojoba oil to the palms of your hands. Gently rub the oil over your palms and then sweep your palms from your ankles to your knees and then sweep up your arms and across your décolleté. Then massage it around your limbs. Applying the Jojoba should take less time than a standard moisturiser. A little goes a long way and you will soon work out how much you need, if you feel at all oily, you have used too much. To prevent a dry, flaky or itchy scalp, gently part your hair and apply a little onto the scalp and massage in. Put a towel on over your pillow and literally sleep on it. In the morning simply wash and style as normal. Your hair will be glossy and your scalp itchy free for around a week. I have been using the jojoba oil as a cleanser, make up remover, facial and eye moisturiser and body moisturiser for over 6 months now and my skin has never felt better. After years of trying different lotions and creams I have finally found a product that suits me. Love the fact that I am using a completely natural product! I wear make up everyday and its fantastic for removing even my waterproof mascara. Doesn't clog pores as long as its been applied to damp skin.